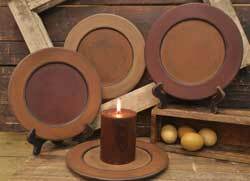 Accent your favorite candle by pairing with one of our candle plates, to make an instant centerpiece! Orange Alabaster Glass Plate, by The Abbott Collection. 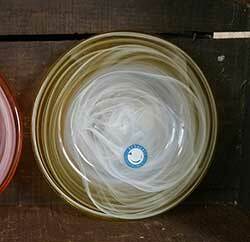 The Alabaster look is created by adding elements to recycled glass. After the glass cools, it is hand painted on the outside using a cold paint process. This one is ORANGE and white swirl. yellow Alabaster Glass Plate, by The Abbott Collection. The Alabaster look is created by adding elements to recycled glass. After the glass cools, it is hand painted on the outside using a cold paint process. 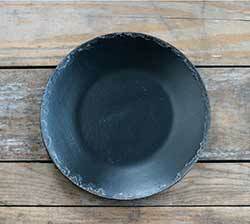 This black primitive wooden plate features an authentic chipped paint rim around the edge for a unique distressed look. 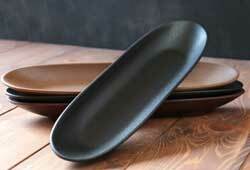 Black Primitive Wood Candle Tray, by The Hearthside Collection. Simple painted and distressed plate, a perfect blank for your craft painting products, or as a candle plate or centerpiece. 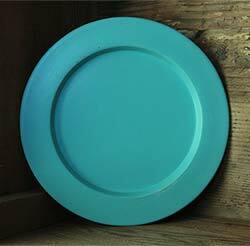 Simple painted and distressed plate, a perfect blank for your craft painting products, or as a candle plate. 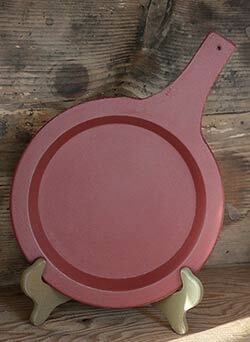 This one is painted burgundy on the inside with a mustard tan rim. 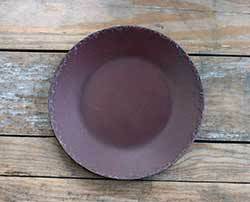 This burgundy primitive wooden plate features an authentic chipped paint rim around the edge for a unique distressed look. Distressed Decorative Plate Plate, by Our Backyard Studios in Mill Creek, WA. This small round plate is entirely hand-painted, using a multi-step process of paint layering, sanding, glazing, and finishing. This one is CORAL PINK, sanded back in places to reveal black and ivory underneath. Perfect piece for primitive displays, such as for rustic candles and rosehips. This is for the Black tray. Perfect piece for primitive displays, such as for rustic candles and rosehips. This is for the Red tray. 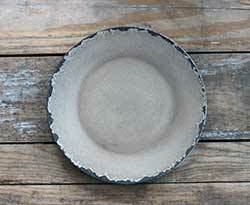 Distressed Plate, by The Hearthside Collection. 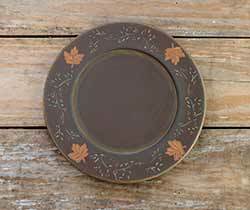 Simple painted and distressed plate, a perfect blank for your craft painting products, or as a candle plate. This aqua plate is perfect for using with candles, as a centerpiece, a catch-all for jewelry/keys/etc, lovely for a wedding decoration, coastal-inspired room, etc. 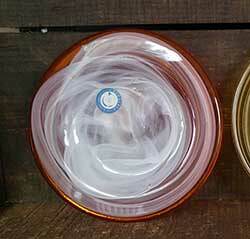 Plate measures 9.5 inches in diameter. Perfect decorative plate for using with candles, as a centerpiece, a catch-all for jewelry/keys/etc, lovely for a wedding decoration, coastal-inspired room, etc. 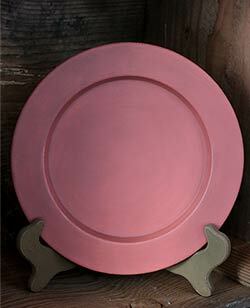 This is for the Coral Pink color, which is a lovely muted coastal salmon pink color. Perfect decorative plate for using with candles, as a centerpiece, a catch-all for jewelry/keys/etc, lovely for a wedding decoration, boho/gypsy-inspired room, etc. This is for the TEAL color, a boho-inspired muted greenish blue. 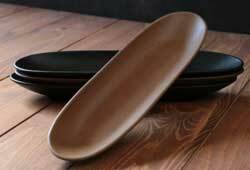 Perfect decorative wooden plate/skillet for using with candles, as a centerpiece, a catch-all for jewelry/keys/etc, primitive fixins, and more! This is for the TUSCAN RED color, which is a cinnamon-colored brick red. 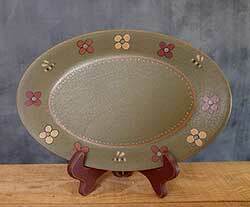 Green Flowers Oval Primitive Plate, by The Hearthside Collection. 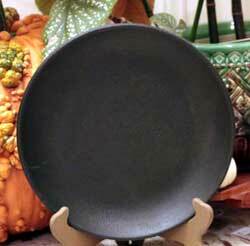 Display this primitive plate on a shelf for a touch of spring decor in your primitive kitchen or living room! This ivory primitive wooden plate features an authentic chipped paint rim around the edge for a unique distressed look. Hand-cast in glass and brass, with speckled glass and ornate legs. 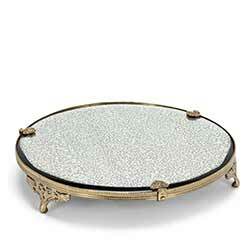 Perfect on a dressing table or as a candle plate! 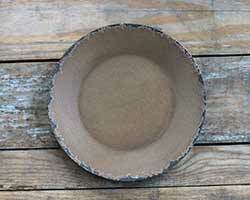 Simple painted and distressed plate, a perfect blank for your craft painting products, or as a candle plate. This one is painted antique ivory on the inside with a mustard tan rim. 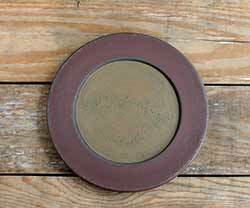 This mustard primitive wooden plate features an authentic chipped paint rim around the edge for a unique distressed look. 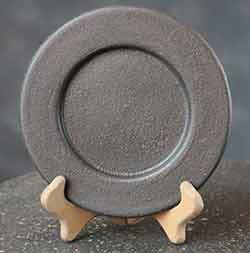 Plain Primitive Plate, by The Hearthside Collection. 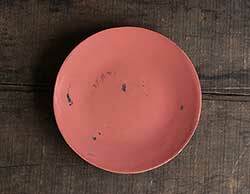 Simple painted and distressed plate, a perfect blank for your craft painting products, or as a candle plate. This is for the BLACK plate. Measures approx 6 inches. Made of hand-painted pressed wood, distressed for a rustic look. Decorative use only (not food safe). 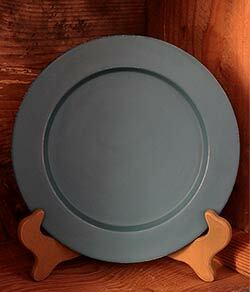 Plate stand also available (sold separately). 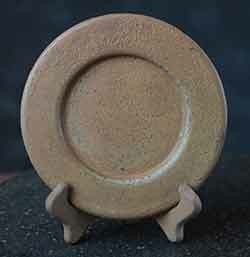 Plain Primitive Plate, by The Hearthside Collection. 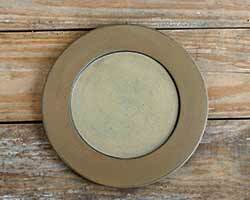 Simple painted and distressed plate, a perfect blank for your craft painting products, or as a candle plate. This is for the MUSTARD plate. Measures approx 6 inches. Made of hand-painted pressed wood, distressed for a rustic look. Decorative use only (not food safe). 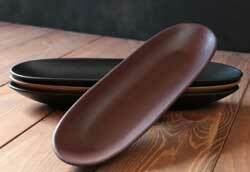 Plate stand also available (sold separately). Perfect piece for primitive displays, such as for rustic candles and rosehips. 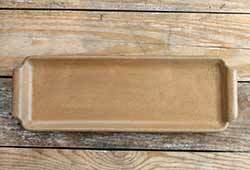 This is for the Mustard tray (right, in photo). Perfect piece for primitive displays, such as for rustic candles and rosehips. This is for the Burgundy tray. Perfect piece for primitive displays, such as for rustic candles and rosehips. This is for the Mustard tray. This large, heavy wooden dish is perfect for primitive displays, such as rustic candles, potpourri, fixins, ornies, or rosehips. This one is painted a rustic mustard. This large, heavy wooden dish is perfect for primitive displays, such as rustic candles, potpourri, fixins, ornies, or rosehips. This one is painted black. This large, heavy wooden dish is perfect for primitive displays, such as rustic candles, potpourri, fixins, ornies, or rosehips. This one is painted a light, oatmeal-colored tan. Perfect piece for primitive displays, such as for rustic candles and rosehips. Painted a country mustard color. 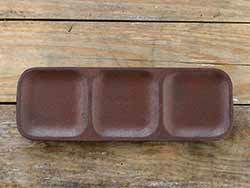 This rustic wooden tray is perfect decorative piece for primitive displays, such as grubby candles, fixins, and rosehips. This one is a distressed black color. 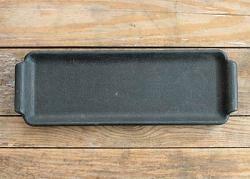 This rustic wooden tray is perfect decorative piece for primitive displays, such as grubby candles, fixins, and rosehips. This one is a distressed burgundy color. 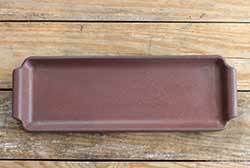 This rustic wooden tray is perfect decorative piece for primitive displays, such as grubby candles, fixins, and rosehips. This one is a distressed mustard color. Simple painted and distressed tray, a perfect blank for a centerpiece display - just add dried potpourri and candles into the three divided sections! 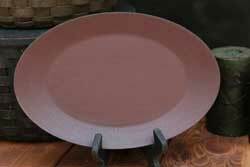 This one is painted a rustic burgundy red color. 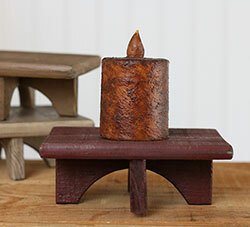 Rectangle Wood Primitive Riser, by The Hearthside Collection. 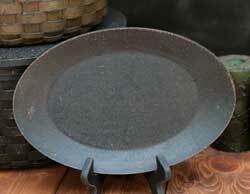 Perfect piece for primitive displays, such as for rustic candles and figurines. Painted a country burgundy color, heavily distressed and rustic.